I’m working my last day at the old job later this morning and then driving up to Maine to start my new job tomorrow. So this marks the last post of five and a half years, and exactly 725 rankings, of Rhode Island based movie watching. My next movie ranking will mark the first of (hopefully at least) that many more Maine based rankings. Nothing will change, but I might be a little colder as I write! I watched CITY LIGHTS (1931) on 8.20.14. It was my first viewing of the film. Made at a time when everyone else had gone to sound films, CITY LIGTHS marks the end of an era for Charlie Chaplin (the later MODERN TIMES was a partial talkie). The list of people who could even have gotten a silent film made in 1931 may only have included Chaplin, and he does his best to not waste this film. He makes this film knowing change is coming. The movie, in theme not plot, is about the end of silent film. Chaplin uses a soundtrack with an original score (which he wrote, naturally) and some well-timed sound effects. He opens the film with some ‘important’ people talking at the presentation of a new sculpture. As they talk, some squawking sound effects fill the air serving as an indicator as to how Chaplin felt about talkies at the time. 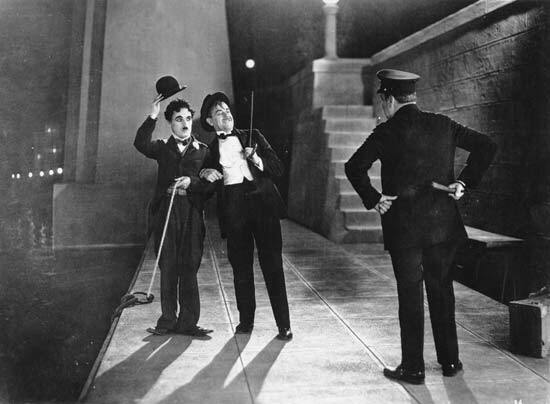 A major character is blind through the entire film and cannot see Chaplin’s Tramp. He throws money at the problem and then she is allowed to be see him, just once perhaps, at the end of the film. We also get to see a rare Tramp smile as he signs off. The plot of the film has The Tramp pursuing the blind flower girl (Virginia Cherrill). He is smitten with her kind face and her delicate demeanor. He falls in, as the Tramp often does, with a bit of trouble. He happens upon a suicidal rich guy (Harry Myers) who has three different adventures with The Tramp. Each time the millionaire wakes up in the morning having no memory of The Tramp and having him booted from the house. Chaplin uses the perks of the friendship when he can, convincing the girl he is loaded with money himself. While this movie is more about plot than some other Chaplin films, it is also a classic Tramp film in the sense that the gags are the draw. In that sense, this is mostly standard Chaplin movie for the first hour or so. There are laughs, to be sure, but none that stand out as major Chaplin career moments. And then the boxing match happens. Having seen a good deal of Chaplin, it’s hard to quantify or rank the various fits of genius he provides. 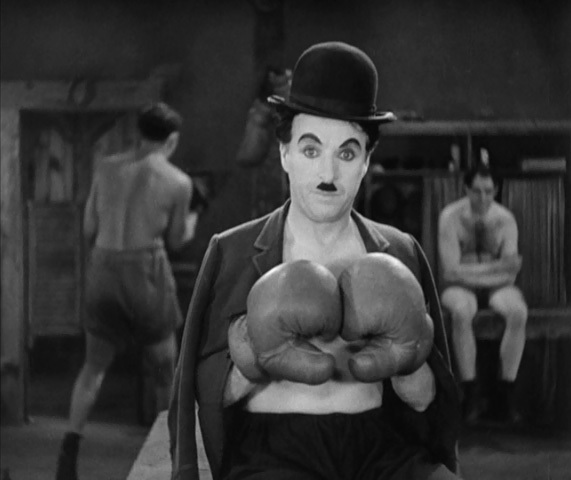 That said, the boxing match in the last half hour of CITY LIGHTS has to be a top three all time Chaplin bit. Heck, the IMDB page uses a poster which makes it look like this is a boxing movie, and the single boxing match is the only bit of boxing in the whole thing. The Tramp enters the building thinking he is going to be in a fixed match, only to get a new and more dangerous opponent (Hank Mann). The Tramp dances around the ring, using the referee as a blocker, and picking his spots. What develops is a segment which stands tall as an all time great silent movie moment. The choreography is both effective and hilarious. I may say this about a lot of subjects, but you only get so many chances to see a Charlie Chaplin film for the first time. CITY LIGHTS is one of the really good ones, and though it appears in the Top 40 of the IMDB Top 250, it is not his greatest achievement. Despite that, Chaplin may do some of his best acting towards the end of the film. It seemed as though he thought he might have been saying good bye for the character forever, even if he did get to reprise him again. The bonus point is for the score and sound effects, which really are effective throughout this film. ~ by johnlink00 on August 21, 2014.